Amanda Murphy Design: Another Quilters Newsletter Fat Quarter Issue Giveaway! 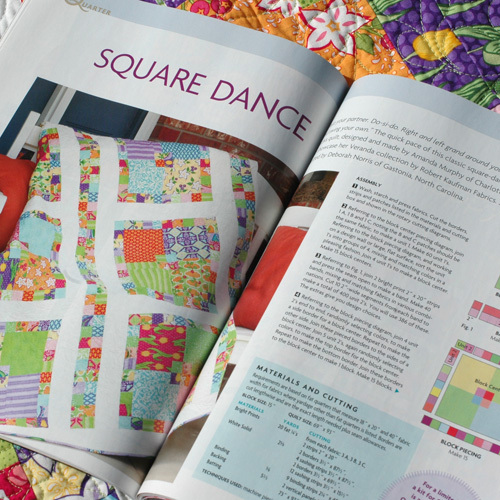 Another Quilters Newsletter Fat Quarter Issue Giveaway! As promised, courtesy of Quilters Newsletter, I'm having another giveaway! 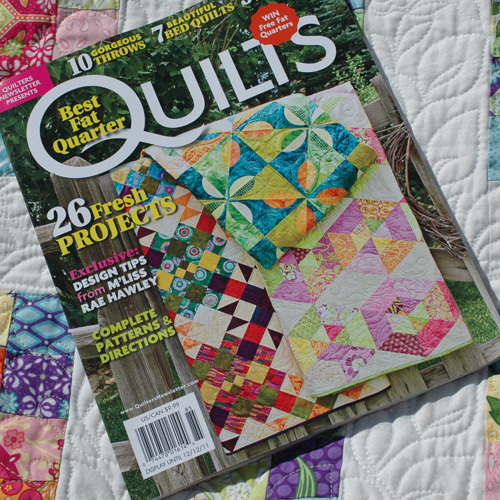 This time there will be 3 lucky winners of a copy of Quilter's Newsletter Special Interest Publication on Fat Quarter Quilts! Fat Quarter shop is kitting Square Dance - you can purchase the kit here! If you would like to enter the giveaway, please leave me a comment telling me what favorite stack of fat quarters you would love to recieve as a present! It can a past or current collection - anything goes! Just to be fair, let's exclude my collections. If you aren't already a follower, please consider becoming one. And don't forget to leave me a way to contact you should you win. Winner will be chosen with the random number generator. Deadline is this Sunday (the 30th) at midnight. I would love some Dentse Schmidt! I know I'm late to the DS party but I'm trying to find as much as I can!! I would like some of Etchings or Tidbits and Treasures, but then, I rarely see a fabric I don't love! 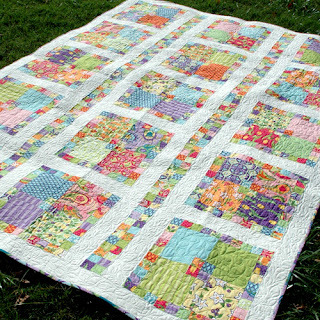 Your Square Dance quilt is lovely! The first fabric that comes to mind is Sunkissed. I don't know if it truely is the one I want most, but I didn't buy it when it came out and it is nagging at me from far away in quilting cyberspace. I'm hoping there is a jelly roll somewhere that would like to come live at my house and maybe spend some time with me this winter becoming something to brighten my winter days! None of the 3 LQS carried it, hmmmmm. Happiness Happy Mochi Yum Yum Fat Quarter Bundle Everything about it says delight. I've been eyeing the Deb Strain Coming Home line for quite a while. I think the fall colors around me make me like it more! I've been a follower of your blog for a while. Your Square Dance quilt is beautiful. I would love a stack of Terrain! Hoffman Fabrics collection and would be so grateful to be picked. Butterscotch & Roses by Fig Tree makes my heart go pitter patter. Thanks so much for a chance and I already follow. I would love a FQB of Good Fortune by Kate Spain. I just recieved a set of Deb Strain fats, and they are spectacular. My heart belongs to Alexander Henry though, with their crazy prints. I love the fabrics from French General a lot!Would love to have some panier de fleurs! Sunkissed by Moda. Loved that line! I'd love a chance to enter - the Hoffman Fabrics Taffy 1895 is a favorite of mine!! I would love Terrain by Kate Spain for Moda--great colors and many different designs! I am in the Christmas mood so I think I would love some "Ready Set Snow" or maybe some "Flurry". Happy Mochi Yum Yum Fat Quarter Bundle For me as it would brighten up these short, wet October days. Fun! I surf the web for Far Far Away 1 and 2 almost daily. Sigh, late arriver to the fabric game, boo! Right now I am leaning towards the Citron Grey fat quarter bundle by Michael Miller. LOVE those yellows, whites, and greys together! Thanks for the giveaway! I am a regular follower. I would love to get a fat quarter set of Terrain. Thanks for the giveaway. I'd love a fat quarter bundle of Parisville. Right now, I'm loving a line called Blueberry Crumbcake from Moda. Your pattern looks perfect for a stack of fat quarters. I would love to make your pattern in Terrain. I wouldn't say no to Patty Young's new Lush line as a stack of fat quarters. Thanks for the giveaway. I would LOVE a great big stack of Parson Gray! Terrain. I've drooled over it since I first saw it. I have a couple pieces, but would love to have the whole set. I'd like the whole shebang of Hometown by Sweetwater. I mean, if I have to pick just ONE. Also calling to me right now are Daisy Cottage, Groovin', Vogue Blue Modernology, White Gold Palladium ... for now ... and well, I never really got over missing out on Good Folks and Katie Jump Rope. They were before my time but I sure admire projects I see made with them. Right now, I'm loving Etchings. I think it's because I'm seeing so many projects made with it. Thanks for your generosity! I would love a fat quarter stack of Peas and Carrots by American Jane! I love batiks and would love to get the new mood indigo batiks. Thanks for the giveaway. I have quite a collection of fat quarters and would love some ideas on how to use them. SQUARE DANCE IS SO NEAT! I THINK I WILL MAKE ONE SIMILAR!THANK YOU SO FOR YOUR BLOG+THIS SPECIAL GIVEAWAY! I'D CHOOSE "HAPPY MOCHA YUM YUM" FQB! I am crushing on Good Fortune by Kate Spain these days. What beautiful quilts! I'm in love with Butterscotch and Roses recently. Can't seem to get enough of it! Kona Solids for me in any colour way or all of them so that I can "paint" to my hearts content. That would be the ultimate gift to this girl's stash. Thank-you. I would love some Freshcut by Heather Bailey. I also like your Ambrosia collection. I would love a fat quarter stack of outfoxed for a quilt for my little one. Thanks for the giveaway! this is my ver favorite! i've some of the pieces and would like to have a few more for a particual project. I love your quilt. I hope I win-I would definitely put that quilt in my bucket list. I would love Terrain fat quarters. I am in love with them. I would love some Central Park! Id love to win this! thanks for the chance! Any line, past or present? That's an easy one! I'd squeal with delight over a FQ set of Tual Pink Neptune. Hey, a girl can dream! I am totally in love with Veranda so of course that comes to mind first. I adore the new pattern out in this issue so wouldn't it be wonderful if I had FQ's to make it ?!! Yep! :)thanks for a chance to win have a great weekend! I've never had a FQ pack, but if I'm dreaming, I'm going to dream big! I love French General lines. :-) Thanks so much for the fun! I don't think I can pick just one. I'm loving Ruby, Terrain and Echo off the top of my head. I would also love to receive a stack of Kona solids too. I'm not too picky. I like Flurry! Really though...I have my eye on Veranda...and I better get serious or it will be gone. My goodness! I had never been to the Fat Quarter Shop! Lots to choose from and hard to narrow it down to just one. But, after much consideration and because I can't choose one of yours, I will go with kate Spain's Designer Choice of Terrain. I love French General, oooh I really love that fabric. I like Azure Alexandra Fat Quarter Bundle Mary Koval for Windham Fabrics. Thanks for the giveaway! I would love a fat quarter collection of Ruby...yes I would! I'm a follower! Thanks! Bliss! Thanks for the chance! Love the new Rouenneries Deux!! Thanks for the chance! I'm anxiously awaiting the arrival of Pezzy Prints by American Jane! Have been a follower for quite some time now. Thanks for the giveaway chance. I have wanted Ruby for awhile now and I also like Terrain quite a lot. Anything by Kansas Troubles. Love the colors she uses. Citron Grey would be nice. I would love a fat quarter bundle of Sunkissed by Moda. I'm a kid at heart. The Grinch that Stole Christmas fat quarters. I would love to win a fat quarter bundle of Circa 1934 by Cosmo Cricket. I love those typewriter keys. I think I would love to win a fq bundle of Basic Grey Curio - love the grungy look. Congrats on your quilt designs, I am drooling over them! I would love to receive a fat quarter bundle of Sandy Henderson's new Secret Garden. Since it's almost my birthday I gifted myself with a beautiful set of fat quarters by Marcia Derse - they look hand-painted! I do like Curio by Basic Grey and I'm afraid I need a lot more than my little set of charm squares to make a project. I would love to the get the Michael Miller Meadowsweet bundle. Thanks for sharing fabric, I like so many, deb strain has gorgeous fabric, any of her fat quarters would be a thrill to own. Sure would like your magazine, thanks. I'd love a fat quarter bundle of Ruby, but I think Veranda is really pretty and would be fun to create with. I really like Max and Whiskers. Oh yeah, and Swiss Chocolate!!! It would have to be Etchings, I was holding a bundle of fat quarters of it today and dreaming what I would do with it. Thanks for the giveaway. Until you said leave your fabric out, I was going to say Terrace Veranda lol, I am dying to get some! Sooo, my choice would be Blueberry Crumb Cake. I'm a happy follower :) There are so many great collections out now, but my two favorites are Ruby and Etchings...gray is so cool right now! Thanks for the chance to win! Oh, I would love a nice stack of Ruby. Thanks for the chance to win a magazine that just might help me use up some fat quarters! I like Terrain by Kate Spain. Thanks for the chance. I'd like Sophie by Chez Moi for Moda! Thanks so much for the giveaway! Etchings! That would be my first choice. Tied for second are Circa 1934, Outfoxed, Cape Ann...there are so many to love. I would love any FQ bundle that is a batik. Great give away. Just purchased some Cocheco Mills III by Judie Rothermel that I like a lot but then saw the line Cocheco Mills IV on the internet, blues & browns that I think I really want & need! I would love Butterscotch and Roses or any collection from Fig Tree, but I also love Kansas Troubles and 3 Sisters. Right now I'm loving Terrain, so a fat quarter stack would be heaven. Thanks. Tough call on which FQ set I would like the mostest but I think I would love to have a set of the Ghastlies. I would love a FQ set of Joel Dewberry's Modern Meadow. Thanks for a great giveaway. Etchings is the fabric line I would like to receive. Great job on Bedazzled and Beribboned. Have a great Sunday! Lark by Amy Butler has really caught my eye recently. Thank you for such a nice giveaway! It's a toss up! Kensington Gardens London, or Meet Me at Sunset! Amy Butler Lark, oh yes please! My favorite is really your Swiss Chocolate but as I'm not allowed to say that then I'll pick Larkspur by Alexander Henry which I would love to receive. Hey, no fair! I truly would like to pick one of yours! OK, then, I would choose Annie's Farm Stand! LOL Thanks for the chance to win the inspiring magazine! I would love to have a Ruby FQ bundle. Thanks for this great giveaway. I'd love to have Hometown or Countdown to Christmas by Sweetwater, or Deck the Halls by Heather Mulder Peterson. So hard to just pick one!! I'd love to have a FQ stack of Heather Ross -Lightning bugz, and that era (yes, it would cost a million dollars -hehe)! I love the little "stories" they tell! Thank you for the giveaway! Thank you for such a wonderful giveaway. I would choose a Ruby FQ bundle or a Butterscotch and Roses FQ bundle. It is hare to choose. I am totally in love with all of the Dear Stella fabrics! Thanks for the give away - the magazine looks awesome too. Now I have to go order more Veranda! It was nice of you to leave your fabrics out of the mix, although I love your Veranda line (especially the purple colorway). Anyway, I also love Bonnie and Camille's fabrics, so I choose "Ruby" as my current fav. Well if I can't choose yours I guess I would pick Daisy Cottage by Lori Holt. That collection just grabs me! Rouenneries the original!! I am so glad Deux is coming out because I completely missed out the first time around. You do know you're dealing with fabricholics, right? Choosing just one is a most difficult decision. Ghastlies particularly in the pink/mauve line is one I love right now though Ruby is pretty exciting. Have a beautiful day. I would love some fat quarters of Ruby. Thanks for the giveaway. Well, I think I might try Ruby, I need a quilt with some gray! Veranda sure is pretty too! I'd love some Ruby fat quarters! I saw a preview of Twirl by Me & My Sisters - can't wait to get my hands on a FQ bundle of that! Congrats on the being published in the magazine. I would love Little Gatherings by Primitive Gatherings. I have to say that I LOVE your Veranda line, and plan on owning some of it, but if I can't pick yours, I'd pick Sew Cherry by Lori Holt. 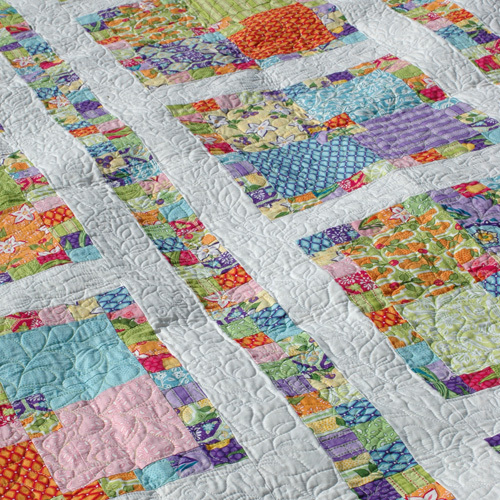 I just love cheerful colors and both these lines are full of happiness :-) Love your new quilt patterns too!! Thanks for the chance to win fro a happy follower. I love this pattern and could see it in almost any fabric, but especially in Butterscotch and Roses. Thanks for the chance to win some fabric ,I have fallen for Kate Spain's Terrain or Butterscotch and Roses is another favorite. I also love your Veranda line which I would have picked if I could. My favorite fabric is still Blossoms by Urban Chicks. I'm selfishly hiding my stash. What a beautiful quilt pattern. Can't wait to get my hands on a copy of this magzine. Thanks a bunch!! RUBY please and THANKS for the chance to win! I am crazy about bali batiks right now, especially ocean colors....thanks for the chance to win. Fun ! Oh, I could name several -- Secret Garden, Terrain, French General's Rouenneries (think that they are re-releasing some of those prints), and Flea Market Fancy (ditto re re-releasing). I adore the saturated, beautiful colors in your fabric line! A My Blue Heaven Kona Cotton Solids Fat Quarter Bundle would just make my day!Thanks for the giveaway! Anything by Kansas Troubles. Love your latest patterns..especially Square Dance. i would LOVE a big bundle of enchino prints. i love them so much, but they don't really fit into my budget, so i only have a few pieces in my stash. this is a great giveaway, thank you so much! i went looking for this magazine after your earlier post, but i haven't found it yet. it's probably still on it's way to Canada, but i'd love to win a copy anyway! There are so many beautiful lines to choose from! But I would have to say that "Ruby" is one of my absolute favourites. Thanks for sharing! I love ruby collection. I'm a follower . Love all your pattern. I really love the Sandi Henderson Secret garden prints!! Ruby would be fun but hey new fabric is always just fun. Sweet giveaway! I have yet to own an entire FQ bundle, so this woudd be a treat! Picking one collection is tough, though. Since Veranda is out of the running, I would love some Ruby. Thanks, lady! I'm a follower & love your blog! I've been very excited about the Tahitian Crazy Daisy collection by Benartex. It's a very fun fabric collection in black/yellow/white! The Best Fat Quarter Quilts magazine looks like a great one. I'm always looking for ideas! I would love some LARK by Amy Butler. I love your pattern and will get that magazine. Thanks for the chance. i love the echings line right now! thanks! I would like to have the entire FQ bundle (or half-yard bundle) of the new Good Fortune by Kate Spain. Thanks for the giveaway as is lovely of you to hold another. Oh I'd love to have everything in Ruby or Terrain. Any colorwave. hehe. Gorgeous fabrics. Hmm - I like Gypsy Bandana and Going Coastal. And MANY others.